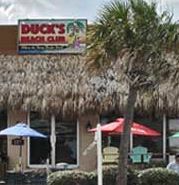 Duck's Cafe is one block from the ocean on Main Street in North Myrtle Beach. We have all types of food from the best hamburgers, hot dogs, balony sandwiches, steak, fish, philly cheese steak sandwiches, to wonderful seafood baskets. We have a sidewalk cafe with live entertainment during the summer months. If you eat in our cafe, you receive free admission to our beach club located next door. All for a wonderful evening of food and entertainment while you are at the beach. Come have fun at the place where the party people party!!! No one got what we ordered....tacos were suppose to come with sour cream and cheese and it was just meat, lettuce and tomatoes!! Love Duck's and Duck's Too, Love to Shag, Love to Watch the best dancers Shag....Love the food.....Love the Tee Shirt....."Shut the Duck Up and Dance" Great new look since our last visit. My daughter were just vacationing in N. Myrtle Beach and dwecided to go for breakfast at Duck's. After walking in and standing there for 5 minutes and watching the waitress walk by us 3 times without a word, we asked to be seated. We were told that there were no available seats. So, I asked if she could clean off the one table where no one was sitting. After realizing there was an empty table and following the blank stare of someone with a hangover, she started to clean the table. After another, older waitress asked "how y'all doing? ", I asked if the owner was available. She said that he's probably upstairs in his office, and kept walking. I will never go there again and will advise anyone else not to go to this hung-over establishment. We had visited this restaurant two years ago during vacation and enjoyed it very much so we went back again this year. The place has been totally remodled, inside and out and they have put tables, chairs, and umbrella's out front and can even cook food and serve drinks out there. It looks like the North Myrtle Beach area on Main Street is finally coming out of the 40's and starting to move in to the 21st Century finally. It reminded me of the cafe's in Key West that are so successful and great tax revenues for the cities, counties, and the State of Florida!! This place is broken up into two clubs and at night they have great entertainment, both out on the sidewalk and in the main club called Duck's. The food, drinks, service, and bands where great!! We will be back!!! Just visited these two clubs this past weekend for St Patricks Day parade. Awesome food, awesome service, great prices, great drinks and a whole lot of fun. This place is hoppin!! The outside is really neat, looks like Key West, decorated really nice, looks so much better then all the other restaurants and clubs in that area. In side was really neat and really clean, not aged and smelly like the other places we visited. Great bands and great music and a lot of neat people from every where and friendly too!! These two clubs are joined together and it's easy to dance in either club but all the food is served downstairs in a club called DUCK'S CAFE. The bartenders were really friendly. Had a great time eating out front, they had nice tables and chairs along the sidewalk, and you can watch everyone going by. This is really the best place to go and eat, drink, dance, and party in North Myrtle Beach. I highly reccommend it to anyone who comes to North Myrtle Beach for any reasons. I'm going back to the event that they call SPRING SOS which starts on April 15, 2010 because they tell me it's the largest adult party in the world and i don't want to miss it at Duck's!!!! We like Ducks...it seems like they have new owners. They are doing a lot of new things like oyster roast and fish frys. They are having some great bands there now. They advertise a free oyster roast on Friday's that is all you can eat from 4 - 8. Don't get there after 6:30 or they will look at you like you are crazy if you want some oysters, you almost feel guilty trying to order them. They have a new VIP program that seems to be pretty good. We have been visiting N Myrtle for 40 years and a few years ago wondered into Ducks too. Great little place with good drink specials and a great grill. Comfortable family atmosphere so that we bring our kids in to eat. I love the fried bologna sandwich. It also has the best people- watching tables out front on the main street. We go here every time we visit. I don't believe this place to be "AVERAGE"...Come on, enjoy a little fun for the night! I enjoyed myself in Duck's & Duck's Too. Great dancer's to watch and enjoy meeting people and great conversation's...I even put a little bit of shag in my step. I think it was the best of both world's. Duck's being where you can shag. Then go to Duck's Too to get something from the grill and enjoy today's music and watch how they move to Hip-Hop and Alternative music. The owner & staff make you feel like your part of the family. Can't wait to go back for S.O.S that everyone was telling me about!